Rarely does the public catch a glimpse of how Darwinists actually behave toward colleagues who disagree with their view of biological origins. Thus, as a public service, I’m presenting here a correspondence, initiated by Darwinists and unsolicited by our side, that provides readers of this blog with such a glimpse. Briefly, a Johns Hopkins biologist named David Levin sent an unsolicited and wonderfully insulting letter to Michael Behe (the entire letter is given toward the bottom of this post). Levin also attached a pdf of a Nature article (see the very bottom of this post). As it is, Levin copied Ken Miller, Richard Dawkins, and the usual suspects. Ken Miller, thinking that Levin had a slam-dunk against ID, then suggested to Levin that he also send me what he had sent Behe (presumably to crush my spirits). Here, then, is the exchange. To trace the chronology, you’ll need to start from the bottom and work your way up. I post Mike Behe’s response to Levin with Mike’s permission. After Behe’s response and my second response to Levin, we never heard from him again. I receive many unsolicited emails asking me to comment on how the theory of intelligent design deals with this or that objection to it. You are asking me to respond to an informal letter that you wrote to Michael Behe sketching out some worries you have about his notion of irreducible complexity. Let me suggest you write up your thoughts in a formal article and submit them to a peer-reviewed publication. Once it’s accepted, I’ll be happy to look at it more closely and offer comment. As it is, Michael Behe was gracious enough to send you some comment on your letter (I’ve pasted his comments below for continuity), though he appears much less impressed with your work than you are. In your note to me below you write: “you seem incapable or unwilling to discuss the data or the inescapable conclusion that emerges from them.” Actually I’m quite willing. If you would like me to speak at your campus on the topic of intelligent design and address your data, I can put you in touch with my speakers bureau. You seem to have missed the point of my letter to Behe. It was not to bring to his attention the Kellis et al. paper. That was merely the starting point, the prerequisite understanding from which my work followed. It did not escape my notice that you had nothing whatever to say about my demonstration of how a real biochemical pathway has evolved to a more complex state. Perhaps all the biochemistry and genetics is beyond you. Still, your criticism of the Kellis et al. paper was telling. Lets see, you asserted that it is now three years old, as though its age as some bearing on the validity of its conclusions. You clued into the phrases computational algorithm and statistical analysis as though such things invalidate any conclusions the authors might derive. These guys sequenced and assembled the genome of a species and aligned its eight chromosomes with the 16 chromosomes of another species. Yes, they used computers and statistics to assist them in their analysis. Its a 10 megabase eukaryotic genome! You sort of need computers and statistics to crunch all that information. Whats important here is to look at the remarkable picture that emerges from this work. A species ancestral to the bakers’ yeast underwent a whole-genome duplication, followed by loss of most of the duplicated genes. This is how bakers’ yeast arrived at current genomic organization. As I said before, there is no other way to interpret these data. But you seem incapable or unwilling to discuss the data or the inescapable conclusion that emerges from them. I am taken aback by the extreme level of intellectual dishonesty that pervades the intelligent design circle. Your tactic is always to deflect and misdirect. Never mind the data, its old, or it uses statistics, or it presupposes common descent. Why are you so afraid of the data? Its as though you creationists have closed your eyes, covered your ears with your hands and are muttering to yourselves My mind is made up, dont confuse me with facts. As for your assertion that nonteleological evolutionary mechanisms are not sufficient to drive the evolutionary process, I have provided an excellent example of precisely how this happens. Deal with it! David E. Levin, Ph. D.
Dept. of Biochem. & Molec. Biol. Hello, Professor Levin, nice to meet you. Well, I see that even though you work in Baltimore, youÃ¢â‚¬â„¢ve managed to avoid acquiring any Southern charm. Most folks consider it rude to send insulting, unsolicited mail to people youÃ¢â‚¬â„¢ve never met, even if you donÃ¢â‚¬â„¢t like their views. I hope at least you are polite toward people who agree with you. Thanks for sending me the brief report on your work. Clearly you are excited about it, so I hope you donÃ¢â‚¬â„¢t mind that I find it unimpressive even if your interpretation of events is correct. HereÃ¢â‚¬â„¢s how I see your scenario: Roughly a hundred million years ago the ancestor of S. cerevisiae had a well-regulated, multicomponent pathway, including a prodigy protein, Mpk1, that had several activities. That complex pathway is taken by you for granted, as an unexplained starting point. Then the genome duplicated. In one of the duplicated copies of the prodigy protein a point mutation caused it to lose one of its pre-existing abilities. In the other copy of the prodigy protein, although it hasnÃ¢â‚¬â„¢t happened yet in nature, you have in your own lab demonstrated that, by golly, a simple mutation can cause the other pre-existing ability to be lost too. IÃ¢â‚¬â„¢m afraid I find all of that unsurprising. It has been known for quite a long time that mutations can inactivate protein functions. The single gain of function in your whole story is the new binding site for Rlm1. That, however, is a comparably modest change; since the consensus binding sequence for MADS-box proteins is about ten nucleotides, with considerable redundancy, such a sequence would be expected to occur by chance perhaps every ten kilobases or so, and either to have been present in some segment of the population at the time of the genome duplication, or to be produced by point mutation very shortly thereafter. Such sites are thought to be gained and lost continually. 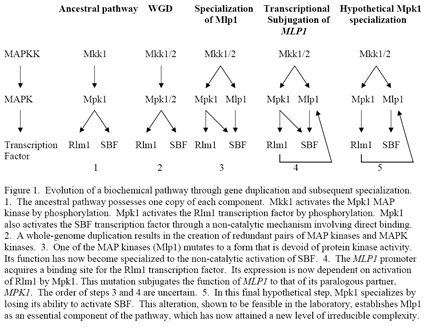 At the very best then, assuming that modern Mpk1 eventually does lose the ability to activate SBF, according to your own scenario we are left with yeast that does pretty much the same thing with two very similar pathways that its ancestor did with one. And that meager (potential) result required enormous evolutionary resources: a hundred million years, whole genome duplication, and huge numbers of yeast likely many orders of magnitude more than the numbers of a vertebrate species that would be available in a similar span of time. Frankly, IÃ¢â‚¬â„¢m puzzled why that is supposed to be an example of the power of Darwinian processes. Id be happy to cite it myself as an illustration of genome drift within tight limits set by severe constraints. The trivial changes the scenario involves would be expected to have been available in the yeast population a very short time after the initial genome duplication event. Yet here we are twiddling our thumbs, tens of millions of years later, still waiting for the scenario to complete itself. This suggests to me that your scenario is overlooking many complicating factors, such straightforward issues as whether genome duplications or gain/loss of regulatory binding sites or loss of protein function even in a duplicated copy are deleterious, and whether there are useful functions close by existing functions. Such questions plague any simplistic Darwinian scenario, including the ones you cite that were proposed for the blood clotting cascade, but it seems few people are willing to take the difficulties seriously. I wish you well with your work, Professor Levin. But please donÃ¢â‚¬â„¢t write to me again unless you can restrain your childish sneers. P.S. – I apologize for bothering all the people who were copied by Professor Levin on his original email. Thanks for following Ken Miller’s advice and emailing me that NATURE article as well as your letter to Mike Behe (I’ve appended both below so that the people I’m copying here know what we’re talking about). I’m sorry you feel you got the worse end of the bargain trading Behe’s book for Dawkins’s latest. I don’t own THE GOD DELUSION, but I happen to have a spare copy of Ken Miller’s FINDING DARWIN’S GOD, which I would be happy to exchange with you for Behe’s. You can send it to P.O. Box 22397, Fort Worth, Texas 76122-0397 and I’ll be sure to pop Miller’s in the mail to you. I’m not sure what the excitement is with Kellis et al.’s NATURE article for which you sent me the pdf. The paper is now three years old and was circulated on a list that I moderate on 4.8.04. It struck me as forgettable at the time. Looking at it more closely now, the paper seems based on a statistical analysis — the authors call it a “computation algorithm” — of the gene locations, etc. Unless the authors justified their algorithm in a way that does not presuppose common descent, it’s another case of circular reasoning. In any case, the issue for ID is not common descent (many of us in the ID community are happy to accept it or at least use it as a working hypothesis). The issue is whether nonteleological evolutionary mechanisms are sufficient to drive the evolutionary process. Ken Miller, as usual, mischaracterized the application of my mathematical work to biology. I don’t argue that evolution cannot produce biological information. Rather, I argue that nonteleological evolutionary mechanisms cannot account for a certain form of biological information, to wit, specified complexity (note that not every biological system need exhibit this form of information). I used to think that Ken Miller was deliberately mischaracterizing my views. I’ve now come to suspect that age and inertia have simply caught up with him. Again, thanks for your email. And please keep me in mind for preprints and articles that are a bit more current. Ken Miller asked that I forward to you this piece of work from my laboratory, sent initially to Michael Behe. I thought you might be interested in the attached evidence from my laboratory for the evolution of a biochemical pathway to an increased level of complexity through gene duplication and subsequent specialization. A surprisingly small number of genetic alterations were required for this transition. Thanks for this wonderful paper and splendid piece of scientific work. May I suggest that you send a copy to my “friend” William Dembski? He argues that evolution cannot produce new biological information, and he might find your work to be “interesting” reading! E-mail: wdembski AT designinference or dembski AT discovery. Having recently read Richard Dawkins latest book (The God Delusion), I traded it to a creationist friend for your book on intelligent design. It is now clear to me that my friend got the better end of the bargain. Many of the weaknesses inherent to your argument that irreducible complexity of a structure or a biochemical pathway precludes its having evolved in a gradual stepwise manner were evident directly from some of your various examples. However, just a modest review of the scientific literature beyond your presentation revealed a pattern of omission of critical information that utterly decimates every one of them. Back in 1996, many critics of your book charitably chalked this up to your ignorance of specific details. However, in the face of an enormous volume of published criticism and detailed evidence countering your claims (not to mention the Dover trial), your new afterward was striking for its glib assertion that there is very little of the original text I would change if I wrote it today. So much for ignorance as an excuse. Rather, your attitude seems disingenuous at best. Nowhere is your need to misdirect more evident than in your flippant dismissal of Keith Robisons clearly presented argument that enzymatic cascades can develop gradually. Robison described in his review of your book a plausible step-by-step mechanism through which irreducible complexity of a biochemical pathway could be achieved through gene duplication and subsequent specialization. By this route, components arise or are recruited that are initially advantageous to pathway function, but later evolve to a state in which they are essential to its function. Your response, I encourage him to develop the argument rigorously and submit it to a refereed journal for publication. If he does so, he will be the first., fails to address the plausibility of this mechanism, which is the issue at hand. After all, you assert on page 90 and similarly elsewhere that In order to claim that a system developed gradually by a Darwinian mechanism a person must show that the function of the system could have been formed by numerous successive, slight modifications. The same argument was advanced by Allen Orr in his review of your book. You dismiss Orrs eloquent, but hypothetical treatment of the subject in your afterward as fanciful and an abstract argument [that] says nothing about the concrete sorts of examples I cited, or that commonly occur in the cell. Again, you fail to address the plausibility of the mechanism. In the unlikely event that you are actually interested in evidence, I have provided in the following section a real example of a biochemical pathway whose evolution to a more complex state can be clearly delineated. Indeed, this pathway has acquired three of four genetic alterations necessary to add a new level of irreducible complexity. The fourth is a simple alteration that we have made in the lab, which certainly could arise spontaneously. It is clear that this example fulfills your requirements for the plausible evolution of an irreducibly complex biochemical pathway. 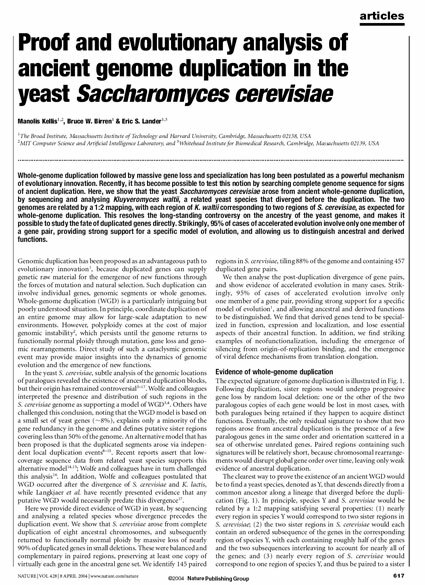 The story starts with the necessary recognition that an ancestral species to the bakers yeast Saccharomyces cerevisiae at some point underwent a whole-genome duplication (WGD). This event was followed by loss of most of the duplicated genes. In case you are not prepared to accept this fact, let me fill in the details. An ancestral WGD was first suggested about a decade ago when the yeast genome sequence was completed. The bakers yeast genome is unusual in that it possesses a high number (12%) of closely paralogous genes. It was observed that the 16 yeast chromosomes could be roughly paired up using closely related genes as landmarks. However, the genes between paralogs were unrelated, suggesting that if the ancestral species experienced a WGD, most of the duplicate genes were lost by deletion. This argument by itself is, of course, not very strong. Incontrovertible evidence came two years ago, with the genome sequence of another fungal species, Kluyvermyces waltii (Kellis et al., 2004 Nature 428:617), which diverged from the Saccharomyces lineage at a time prior to the presumptive WGD event. Kluyvermyces waltii possesses eight chromosomes, each of which can be aligned with the two related copies of the smaller bakers yeast chromosomes. From this alignment, it is easy to see which genes were deleted from which copy of the duplicated yeast chromosomes, thereby confirming that the Saccharomyces genome resulted from a WGD, followed by deletion of most of the paralogous genes. There is, quite frankly, no other way to interpret these data. The Kellis et al. analysis of paralogous Saccharomyces genes and Kluyvermyces genes revealed that in many cases, one copy was evolutionarily restrained to carry out the ancestral function, whereas the other was free to diverge at an accelerated rate. Such is the case for the gene pair that is the subject of our example (outlined in Figure 1). These paralogous yeast genes, called MPK1 (for MAP Kinase 1) and MLP1 (for Mpk1-Like Protein), encode proteins whose functions are activated through a complex pathway of protein phosphorylation, known as a MAP kinase cascade. This cascade is activated in response to cell wall stress and is essential to the maintenance of cell wall integrity in fungal species. The Mpk1 protein retains two ancestral functions, one of which is protein kinase activity against targets that include a transcription factor called Rlm1. The second function of Mpk1 is highly atypical– it acts as a co-transcription factor (with another factor called SBF). Both of the Mpk1 functions require its activation by an upstream protein kinase (Mkk1/2), but its co-transcriptional function does not require its catalytic (protein kinase) activity. Now lets consider Mlp1. Relative to Mpk1 (and all other known MAP kinases, of which there are more than 100), this protein has sustained two critical mutations that interfere with its ability to position ATP in its active site, and hence block its protein kinase activity (Levin, 2005 MMBR 69:262). We refer to Mlp1 as a pseudokinase. Either mutation alone would have been sufficient to block (or at least severely impair) catalytic activity. Despite this catastrophic impairment, Mlp1 has retained its co-transcriptional function, which as noted above, does not depend on catalytic activity. That is to say, its function has become specialized. As an added twist, expression of MLP1 is under the control of the Mpk1-activated transcription factor, Rlm1. This regulation resulted from the MLP1 promoter having acquired an Rlm1-binding site (Jung and Levin, 1999 Mol. Micro. 34:1049), and subjugates the function of Mlp1 to that of Mpk1. The order of these last two steps (mutational loss-of-function and transcriptional control by Rlm1) is not clear, but neither is it important. What is important is that they happened. So, in three incontrovertible stepsgene duplication, followed by two mutations (loss of catalytic activity and acquisition of an Rlm1-binding site), the MLP1 gene and its encoded protein have progressed 75% of the way toward a new level of irreducible complexity. The final step, which may or may not eventually happen, is specialization of Mpk1 through the mutational loss of its co-transcriptional activation of SBF. We have shown that a simple deletion mutation within the MPK1 gene is sufficient to effect this specialization. We are currently preparing this work for publication. Two aspects of this example are particularly compelling. The first is the inescapable conclusion that MLP1 and MPK1 are paralogous genes that resulted from a duplication event. The second is that only a small number of functionally important alterations were required for the specialization of MLP1 and its functional subjugation to MPK1. From this and other examples cited by a considerable number of critics of the argument from irreducible complexity, it is unmistakably clear that gradual evolution of an irreducibly complex pathway is not only plausible, but it is happening! And its been happening through mechanisms like the one described above for billions of years. Like it or not Dr. Behe, no amount of dissembling on your part is going to change that. Some such pathways are so ancient that the tracks of their evolutionary history have nearly been covered by the sands of time. Nevertheless, the close sequence similarities shared among the proteases of the clotting cascade, the caspases of the apoptotic cascade, and the protein kinases of MAP kinase cascades, to name but a few, are evidence of more than just common descent. They reveal the likely evolutionary origins of the pathways in which these enzymes participate. On a final note, I must tell you that I was forced to put your book down in disgust at the end of the section entitled What will science do? Your prediction was so laughable as to warrant repeating here. The theory of intelligent design promises to reinvigorate a field of science grown stale from a lack of viable solutions to dead-end problems. The intellectual competition created by the discovery of design will bring sharper analysis to the professional scientific literature and will require that assertions be backed by hard data. The theory will spark experimental approaches and new hypotheses that would otherwise be untried. A rigorous theory of intelligent design will be a useful tool for the advancement of science in an area that has been moribund for decades. Oh please, Dr. Behe, would you be so kind as to direct me to the scientific literature on intelligent design that has undoubtedly emerged in the intervening decade since you made this bold prediction? Whats that you say? There is none? Could it be because intelligent design is not a scientific theory? Could it be that it makes no testable predictions? Could it be that it suggests no method for investigation of the presumptive designer? The notion of intelligent design offers us nothing and threatens to obscure the truth. Congratulations, Dr. Behe. You have succeeded in mobilizing a new warrior to the defense of science education from the spread of your particular brand of blinding ignorance. As a boy, someone should have taken Dr. Levin out to the woodshed for a good wooopin’ the first time he adopted the sneering, insulting attitude affected in his letter to Dr. Behe. You can’t make this stuff up! I’ve heard just a couple of lectures/debates featuring Michael Behe and have been struck by his exceedingly pleasant, polite and respectful demeanor. His response to Dr. Levin, under the circumstances, further reinforces for me what is a rather lofty opinion of Dr. Behe. The guy seems like a class act all the way around. Quite a contrast, I would say, to Dr. Levin. Levin seems oblivious to the fact that his prime example of the ‘power of Darwinism’ shows that it took 100,000,000 years for yeast to turn into… yeast! Well, being a fly on the wall has always been one of my secret desires, so I can count me very happy. Coming to Dr. Levin’s arguments (I have nothing to add about his civility…), I must admit that I miss their supposed meaning. Apart from Behe’s perfectly convincing comments about the probability of the described mutations (again, no CSI here, it seems), and apart from the completely speculative context of the “reasoning”, and the many circularities in it, there is a fundamental aspect which I can’t understand: where is any reference to function in that example? I suppose the “original” cascade described has some function in the original bacterium. As far as I know, these intracellular cascades have an important informational value: in the eukaryotes, they “carry” information from the membrane (and therefore from the outer environment) to the nucleus, where the final effectors are the transcription factors. I think their role in prokaryotes is in some way similar. The point is that the relevance and importance and utility of an informational transmission cascade is not in the cascade itself, but in the information it carries, which must be “intelligently” coupled to the right final effect, and to the cascade’s ability to regulate the relationship between stimulus and response. Intracellular cascades are, in a sense, very similar to a nervous control system: they serve to communicate, regulate, control. Now, where in the world is any reference to these functions in Levin’s “reasoning”? Where is the new function acquired by the “new” cascade? (obviously, with the final “intelligent” help of Levin’s lab?) Where is the step by step increase in function which should have motivated the fixation of each step? Or is Dr. Levin presenting an issue of purely casual, non selected, non complex, and ultimately useless “microevolution”? And above all, given that the original letter was sent to Behe, where is the IC, if no reference is made to function? I supposed the concept of IC was purely functional: a machine whose function is lost if a part is subtracted. I understand that here the old function is preserved by the supposed duplication. Well, good for the bacteria! But where is the new, irreducibly complex new function which has been acquired, be it with Dr. Levin’s help? Or is the point that it is thrilling to observe that proteins may casually mutate so that they may casually interact, just for fun, without serving any useful purpose? (except, maybe, exciting darwinists). But, let’s look at another possible scenario, which is not the one presented by Levin, but which could have happened sometime, somewhere: if, after a gene duplication, a few mutations in some of the duplicated genes had produced exactly the designed pattern necessary to have a new, separate cascade available, with the exact biochemical characteristics and regulation abilities necessary to transmit and control a signal for a new function, which had been at the same time intelligently prepared in other parts of the genome, and the right connections were made for the new function (coupling of a new stimulus and a new effect by the new cascade), and the new function and its regulation were intelligently integrated in the already existing network, with just the craftiness, creativity, elegance and balance which uniquely may allow a new scenario, a new miracle, a new masterpiece of biological art to emerge, without losing the previous values and adding new ones; then what would you call all of that? Wouldn’t that be true CSI? Wouldn’t that be true IC? Wouldn’t that be true, beautiful, thrilling, loving design? LOL! I love this response. Seriously, though, 100 million years!?! And he thinks this is worthy of a nasty email to the leading ID guys? I think there will be such a backlash against the scientific community because of “scientists” like this Levin. Anybody aware of the status of Behe’s new book? The Edge of Evolution I have been anticipating its publication but haven’t heard any news in a few months. Their childish taunts betray a lack of intellectual foundations. Any who resort to this kind of trash know that their time has come. I think this exchange went better in Levin’s head than it did in real life. I might be mistaken here, but after re-reading Ken Miller’s letter, it seemed a little like he was goading Dr. Levin on to destruction… sort of like sending the local bully to pick on Mike Tyson in a bar, then sitting back to enjoy carnage. Priceless! Levin seems oblivious to the fact that his prime example of the Ã¢â‚¬Ëœpower of DarwinismÃ¢â‚¬â„¢ shows that it took 100,000,000 years for yeast to turn intoÃ¢â‚¬Â¦ yeast! That sums it up perfectly!! Levin’s arguments reminds me of debates I once had concerning the merits of certain baseball players. When I was in the 5th grade. While most of it went right over the top of my head, I am surprised by Dr.Levin’s attitude. If he is correct he doesn’t need to force the issue in such a manner… Maybe he picked it up from Dawkin’s book? Dawkin’s is quite smug throughout the God Delusion… maybe it is a meme! Dr. Levin seems educated well beyond his manners. He is a scoundrel. Speaking as someone who is anything but a YECer – I’ll happily accept most of what I hear with regards to evolution as a theory. Mind you, I’m anything but a scientist, but I’m being honest here. That said, Levin comes across as unhinged. It’s all smirks and chuckles when he’s comparing notes with someone who agrees with him – but a simple, polite “I don’t see it the way you do” launches him into a tirade. We should ask one of those pioneers of evolutionary psychology why even learned men like Levin react the way they do to simple disagreement. Is it rooted in the primal aggression of pre-human ancestry? Or is it just a more malignant form of the common ‘pouty’ meme? And this is why I find myself siding with the ID crowd: All they’re doing is asking questions, pointing out flaws, and – horror of horrors – proposing ideas. There’s plenty of room in legitimate scientific arenas for disagreement, even strong disagreement. But you wouldn’t think so by how – Dembski said it best – emotional people like Levin get over the issue. Having a PhD does not make his word law. He’ll have to deal with that. The most striking thing to me is the use of the word “Proof” in the title of the paper. That word is used regularly, with a very precise definition, in mathematics, but it’s not something often claimed in life sciences papers. It makes it sound more like an op-ed piece than a scientific report. Scientists report experiments, data, and conclusions, with appropriate caveats. They rarely claim to have “proven” anything. Does his evidence rise to the level of “proof?” Perhaps. But genome duplication is hardly “proof” of Darwinian evolutionary progress, as Dr. Behe so deftly pointed out. Therefor, for any amount of work, money increases as knowledge decreases. Many professors have learned more and more about less and less until they know everything about nothing. But they’re tenured and well paid. And think of the educational levels of most professional athletes. Levin seems oblivious to the fact that his prime example of the Ã¢â‚¬Ëœpower of DarwinismÃ¢â‚¬â„¢ shows that it took 100,000,000 years for yeast to turn intoÃ¢â‚¬Â¦ yeast! ItÃ¢â‚¬â„¢s kinda like a trash masher that can turn 10 pounds of trash into 10 pounds of trash. LevinÃ¢â‚¬â„¢s example demonstrates what abysmally low standards of evidence are deemed acceptable by Darwinists as slam-dunk proof of the theory. The more I think about it, the more I’m convinced guys like Levin are their own worst enemy. Is there a more vivid example of Darwinian fundamentalist thinking than Levin’s email? I wonder what an unbiased judge would think of the whole exchange? How about a high school student who’s “on the fence” regarding NDE? Levin and folks like him are doing an excellent job of promoting ID. to go from using paws to hurl excrement at each other to using electrons and photons to hurl excrement at each other. Well that was confusing. It is hard to tell the difference between correspondence with David Levin and a similar correspondence I had with John Mercer. Do these guys all read from the same play book ? Jason, actually, yes, portuguese darwinists act in the same way: personal offences, useless insults, patronizing atitude, and all the rest. It’s as if they are in deed reading from the same script. Their religious response to attack is world wide similar.
. I don’t argue that evolution cannot produce biological information. Rather, I argue that nonteleological evolutionary mechanisms cannot account for a certain form of biological information, to wit, specified complexity (note that not every biological system need exhibit this form of information). Thank’s Bill, that’s my position as well. Unfortunately some of our comrades take the “no information” position, and that is a vulnerable position. That is a position that seems to be found in the writings of Werner Gitt, AiG, and other writings (sadly even John Sanford who took his cue from Gitt). Dare I say, I think even Michael Egnor may have articulated that position. Behe’s response to Levin touched all the right bases (no pun intended). Well, let me see, if this “never” happens, then what has been demonstrated? If you look at the Figure Levin provides, unless there is the loss of its “co-transcriptional activation of SBF,” then the original protein continues to do exactly what it did in its ‘ancestral form’. So, I think it’s important whether this “loss” happens or not. My hunch is that the reason he writes, “…which may or may not eventually happen,…” is because statistically one would have thought this would already have happened somewhere over the last 100 million years. And, a “deletion” is, I would suspect–someone can inform me–a bit ‘rarer’ than a simple SNP. you are obviously perfectly right in reaffirming, with Dembski, that only CSI and IC are, in principle, considered not attainable by “natural” mechanisms in the ID framework. That’s the correct position. And I agree with you that affirming that “no information” at all can be justified that way is a “vulnerable” position. But, anyway, I think that it is useful to strictly examine any supposed example of information building exhibited by darwinists (or at least the most important), even if it is at the “microevolution” level. It is useful, because it is very likely that we find, most of the times, only false examples, where really no new useful information is built. As the “microevolution” examples are often cited as proof of macroevolution, of CSI and IC building by natural mechanisms, they deserve to be falsified, or at least exhibited for what they really are. Egnor, to my knowledge, has not affirmed that no new information can be built by random causes, but he has indeed repeatededly asked some “measurement” of how much new information can be generated that way. The only answer, to my knowledge, was PZ Myers pointing to ACE1 mutation in mosquitos, which, as we have extensively discussed in another thread, is only an example of loss of information. Levin’s example is more interesting, in my opinion, but even more flawed. It is, obviously, only tha artificial attempt to demostrate how a “cascade” could evolve. But again, it is a very “strange” example, which seems only to demonstrate how an existing cascade can “change”, if necessary with Dr. Levin’s help, without acquiring any new function, or may be losing it (it is not clear what happens if and when Levin adds the last mutation in his lab. Has he created a new species?). Moreover, again I ask where is any reference to function, and to selection? What has been selected, and why? (apart from the last mutation, which could obviously be selected by Levin’s obstinacy). Moreover, it is important to observe that Levin points to few single random events (three in all, plus the lab one). Of the four, only two (the second one, and the lab one) can really be considered of the “single bit” kind, and therefore have a reasonably high probability. Indeed, like in the other examples I cited before, both of them cause a loss of function. That is interesting, because it seems that darwinists always end with a “loss of function” mutation when they try to detail a mechanism. Moreover, out of two “loss of function type”, “easy” mutations in the Levin model, only one has occurred naturally, unless Levin has been officially hired by natural selection in the last few days. The other two steps are more interesting. I will not comment on the third one, that is the acquisition of a new “regulation” site on the mutated molecule, because it is not detailed in Levin’s work, and I have no idea of the molecular basis, and therefore of the complexity of the necessary variation. We have Behe’s comment stating that it is not too complex, regarding a motif of about ten AA, and that’s enough for me. Still, I would like to say that the creation of a new recognition site, even if only of 10 AA, is well different from a single casual event, and that its probability, although not at the CSI level, is anyway quite low. In experimental studies on bacteria, no beneficial (correcting) mutation involving two AA could be obtained in the lab, while one AA corrections were easily obtained. The fact that a new “regulation” site is now present in the mutated molecule tells us nothing of how it may have appeared, especially in absence of any information about function. And we must consider that “regulation” is here used incorrectly by Levin: the simple fact that there is a recognition site between two molecules, although impressing, is not necessarily the proof of a “regulation”. Regulation means that there is a network or at least a specific feedback, which has a specific functional utility in determining the levels of activation of a molecule. For an information cascade, regulation of a step means that that step is a “switch” where a specific information can interfere, giving an useful result. I find no reference to such concepts in Levin’s discourse. I will comment, instead, on the first step, the WGD, which is the only step which seems to be well documented (although not by Levin)in the Nature article. As I have not access to the original article, and cannot read well the low resolution image, I am commenting on what Levin refers. A point which I think is very important about duplications is the way they are easily assumed to be random. Why? Have we considered all the possible duplications which could occur, regarding single genes, whole genomes, random parts of genes, random part of non coding DNA, and so on? How likely is it that a useful duplication of genome parts may occur? Here, we are given the example of the supposed duplication of a whole genome from one bacterial species to another. The subtext is, obviously, that such a duplication has been an essential step in speciation. The interesting thing is that most of the duplicated genes have been lost (due to NS, I suppose). But, again, we have no idea or model of the functional advantages which should have allowed the selection and fixation of the WGD first, and of all the gene losses (or conservations) after (exception made for the interesting chance that Dr. Levin could perform his experiment, and that we could friendly chat here about it). And finally, the very concept, often affirmed by darwinists, that gene duplications may have the meaning of having a copy of an existing functional molecule, so that variations can be realized on the copy while function is maintained by the original, is very interesting. Does it ring a bell to our friends computer programmers? Or just to anybody who has used a word processor to compose a text? Isn’t copy and paste the easiest algorithm to be able to write new information when you want to partly reutilize the existing one? Isn’t reutilization and modification of existing objects, and heredity of information, the basis of object oriented programming? Very interesting thought! If you needed a specialization of X, you could duplicate X, specialize it, and then shed the excess functionality as an “IS A” relationship. b) What mechanism would the genome use to shed the excess genes? That sounds like a huge, potentially very productive, area of research. I want to learn more about this story – more about the debate – any suggestion on a lay person level book that help us non phD types (in genetics) get a real grip on this. JM Ridlon was using similar “proofs” in another blod stream I was trying to address, but he just kept on keeping on in a similar Levin fashion. Perhaps Behe’s new book? Let me give a thought experiment on how information increase can happen. If one has tape recorder, one can increase information on a blank tape through the act of recording. If a biological system (be it a single organism or population) is pre-programmed to record information (like a tape recorder), it increases it’s collective knowledge of the environment. Whether the knowledge is consciously stored or not, it is still knowledge. It would not be a stretch then to say the organism could then use this knowledge to build specified structures and systems such as novel proteins. This is way to increase the amount of physical artifacts which evidence specified complexity. This raises interesting issues with the law of conservation of information which are worth pondering…. The combintarial immune system is an example of such a knowledge gathering and knowledge acting system. This happens at the organismal level, but who is to say it can’t happen at the population level? I’m not so sure of AiG’s claim. I wouldn’t be too confident in asserting an organism won’t synthesize novel proteins, especially if has built-in heuristic guidance akin to the combinatorial immune systems ability to heuristically prune novel DNA strands. We see in the transition from a catarpillar to a butterfly the synthesis of a wholly different proteome (possibly via alternative splicing) as a buttefly. It’s not too much of a strech to speculate front-loading can work in a similar way…. When a 3 meg Mp3 decompresses into a 60 meg Avi file, is that an increase in information? It’s not a stretch to speculate genomes could pull off similar tricks of decompression. Is there information increase such cases? One could argue either position I suppose. The better position to adopt is that non-telic processes cannot generate large scale specified complexity. Certainly not. Everything of consequence in the Avi, by definition, was previously in the Mp3. Eric, you’re forgetting that in each given compression/decompression scheme the input/output files are only a part of the system the other one being the compression algorithm. According to Shannon’s theory basically the purpose of the algorithm is to encode information within a shortenÃƒÂ¬r file. BUT the information content of the compressed file cannot be decoded without the knowledge of the algorithm (or without guessing it). I have been meaning to post on compression algorithms as it is relevant here, especially to fans of front-loaded ID.